Load the Game you want to Add Cheats for and then go to Options and then Cheating . The Cheats Dialog Menu will now be open. 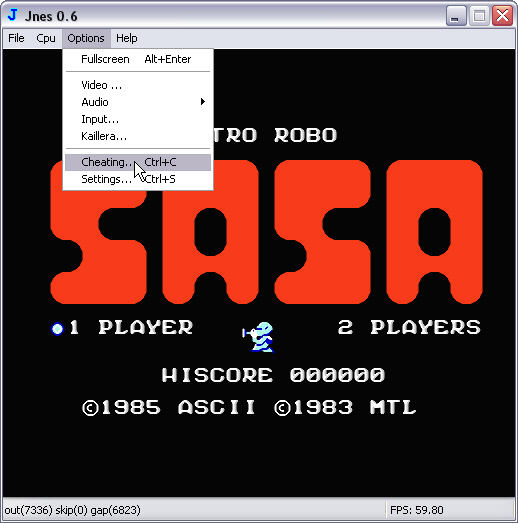 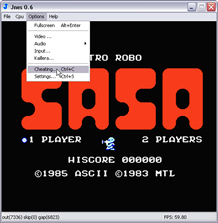 press the Add button and an Option for adding either Game Genie or Pro-Action Replay context menu with appear. This gives you a very unique choice with Jnes for adding cheats! It is the only Nes emulator that allows you to add and use Game Genie and Pro Action Replay Codes plus multiple cheat codes on one adding. 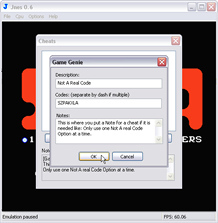 Click on Add and choose the Game Genie Option from the Context Menu. You will now see the Game Genie Dialog where you add your new codes. This is where you write the name of the Cheat you will be adding. This is where you write the code/s you will be adding, but Make sure the Code is written like above xxxxxxxx (not xxxx-xxxx) or separate them with a - like xxxxxxxx-xxxxxxxx if there are more then one code being added. so here is an example Above & below of 2 & 3 codes to one cheat. Once you are finished adding they are ready to use. When you are done with the Cheats menu Just click the top right hand side x to Close and that is all there is too Adding Game Genie Codes into Jnes. 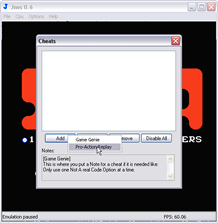 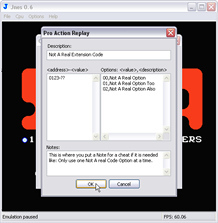 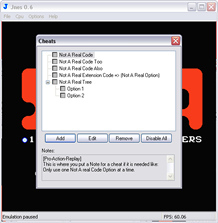 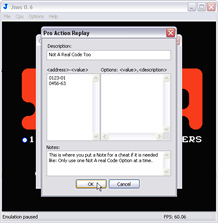 As explained above; you can also add multiple codes to one cheat code adding, so here is an example Above of Pro Action Replay codes to one cheat. 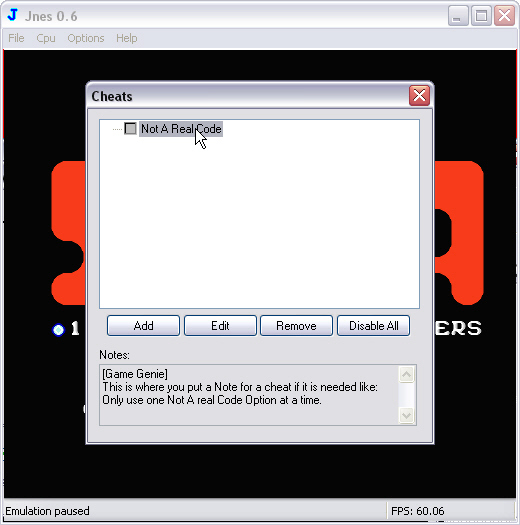 You can not use Infinite\Ammo or Infinite\Health with Infinite\Ammo\Player 1 and 2 or Infinite\Health\Player 1 and 2. 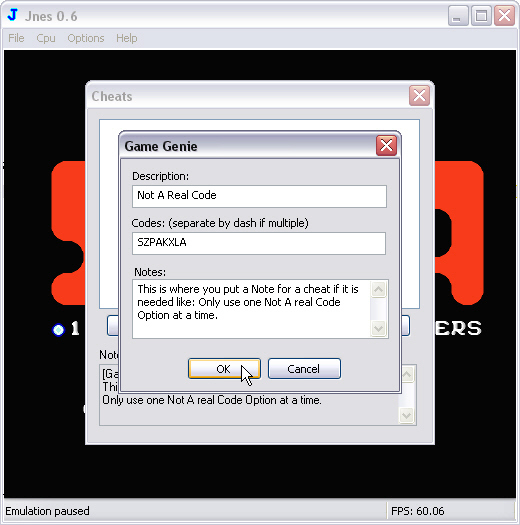 Its either one format or the other in the same game entry! If adding a code meant to have an extension on it, you can only use one code not multiple, and is best wrote like: xxxx-?? and then write the extension details in the Options box. 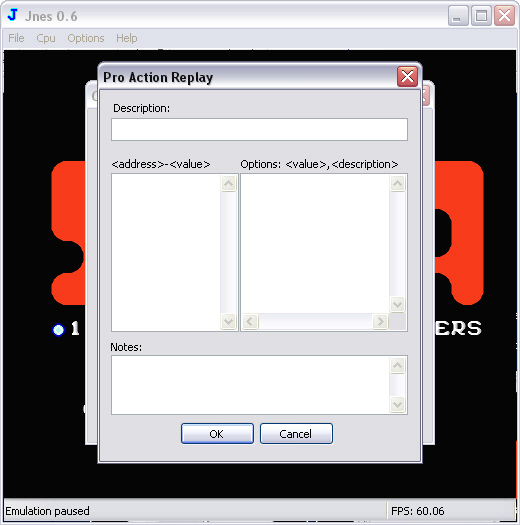 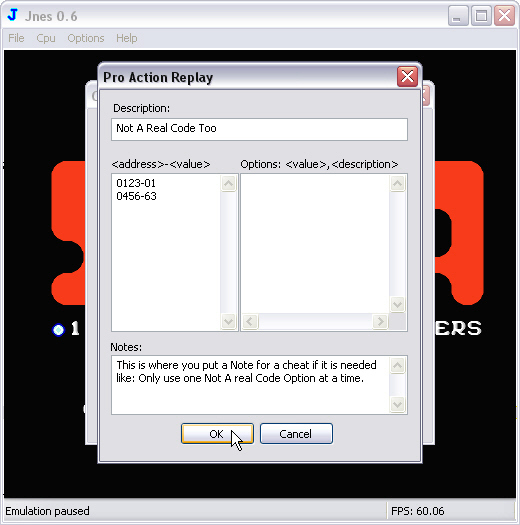 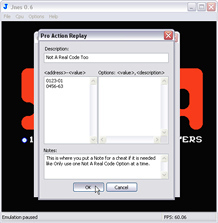 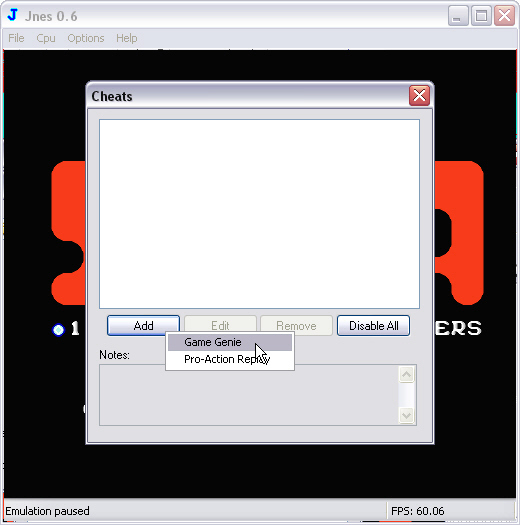 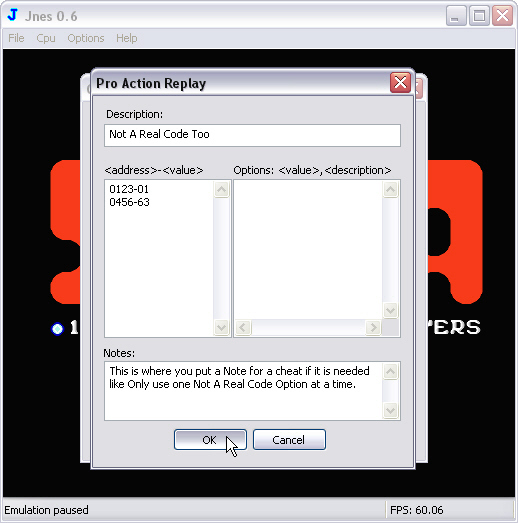 When you are done with the Cheats menu Just click the top right hand side x to Close and that is all there is too Adding Pro Action Replay Codes into Jnes.